click photo to enlarge After Hue, we drove along Highway 1 with our destination for the night being Hội An. This drive is reputedly one of the most beautiful in Vietnam, and for us, it was the prettiest one we saw. We drove along the coast passing through rice fields, fishing villages and past areas where they farmed for shrimp and fish. 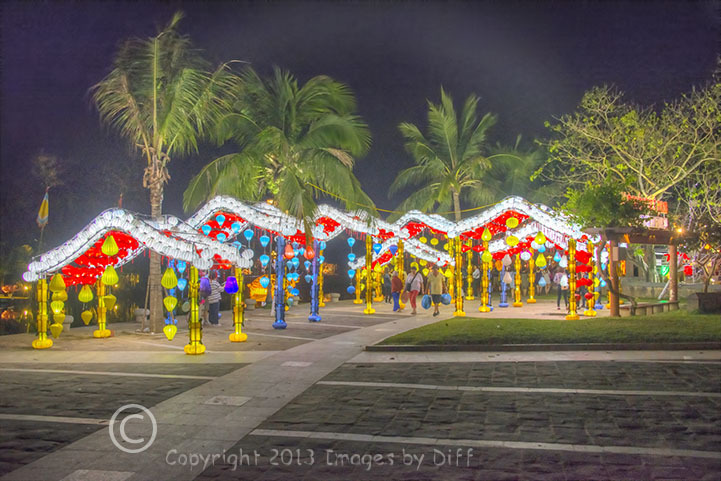 On the way to Hoi An, we stopped in Danang. Danag had one of the world’s busiest airports on the military base during the war. 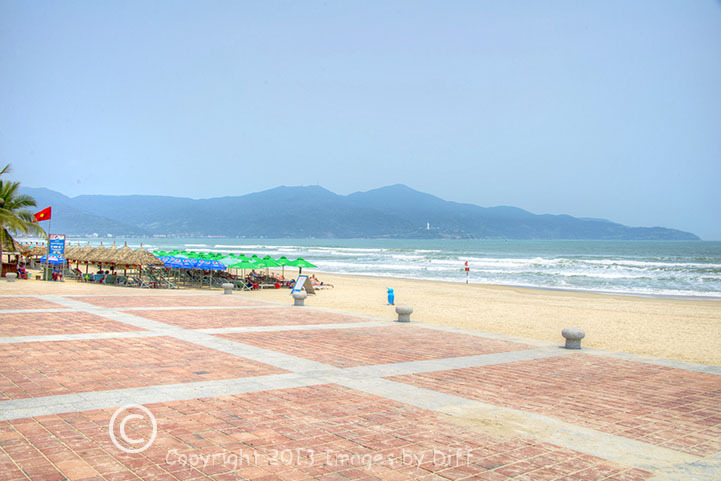 Danang also has many pretty beaches and we went past Red Beach, which was the site of the landing of the 9th Marine Regiment, the first US combat troops deployed to South Vietnam in 1965. 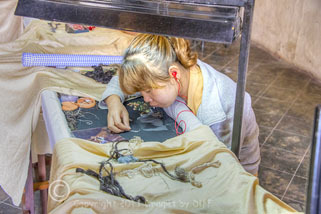 While in Danang we stopped at a museum and at one of the many stone carvers in the area. 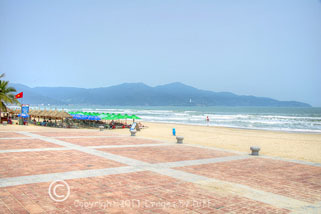 Danang is located near the marble mountains and is famous for all of its marble carved statues. click photo to enlarge We arrived in Hoi An in time for another outstanding lunch. 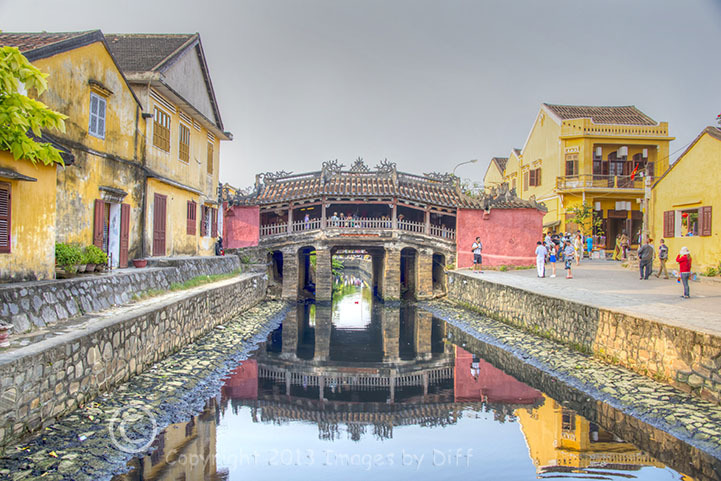 After lunch, we spent the rest of the day and evening exploring Historic Old Town Hoi An. 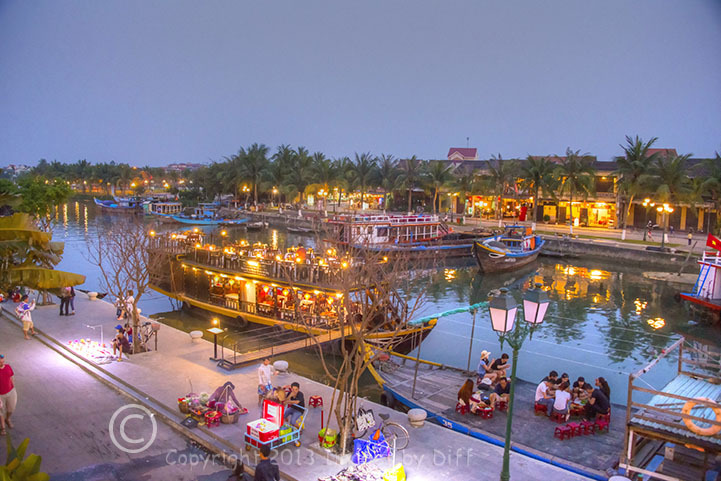 The Old Town area is another UNESCO world heritage site and you will see a few photos taken after dark. We ate dinner on the second floor of a restaurant overlooking the river, and watched people set up for the night market, as the sun went down. 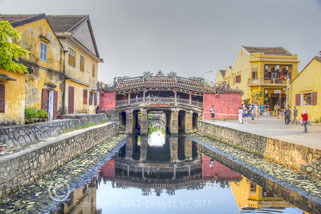 This town, Hoi An, was the favorite for all three of us, and it would have been nice to spend another day here exploring on our own. Unfortunately, the next morning we would be flying to Saigon or Ho Chi Minh City. click photo to enlarge Our Hotel in Hoi An had real possibilities, but like Hue they missed the mark on a few things. The room was large, clean and modern, but the design of the shower was pretty poor. The door did not seal well at the bottom, and we had a large amount of water on the bathroom floor to sop up. Breakfast the next morning was an enjoyable buffet and you could sit outside alfresco. The breakfast area was the nicest one of the trip, but like most mornings, we had to be moving on in order to catch our flight to Saigon.